Its that time of year when I remove more of the lawn and extend and reshape the borders in the garden. The basic borders are now getting quite established and for the last year or so I have not really made any major changes, I have just tweaked around the edges. This year I would say I have achieved a major tweak, it is not a great change in shape or in size, but it is change of feeling I think for the garden. The Long Shoot started out looking like this (with a Geoffrey). I marked out where I wanted to extend the borders to and killed off the grass. 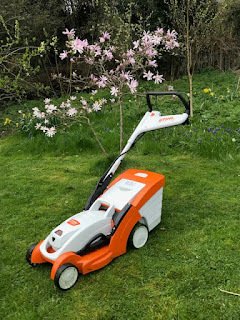 This has two benefits, the first one is that it removes all the lawn weeds that would otherwise plague the new borders, it also helps me see if the shape I have chosen is actually right. I can spend quite a bit of time getting used to the new shape and deciding whether to finally commit. I needed to wait for some rain to soften up the soil a bit. We have had very little rain in recent weeks, the odd day here and there and my clay-based soil has been hard as rock and cracking in places. Even with slightly softer soil it is still quite hard work to turn it over. I have to set myself targets when I get can take a cold drink break or a lunch break. It ensures I keep going and get the task done. I do not enjoy digging really and would rather find other things to do if I can, but every now and again I know it is good for me. Slowly but surely the new shapes start to take appear. The Pond Border now swirls around into a point, I like to think of it as a Burtonesque Curl, making the formal lawn a bit more circular. The Spring Border is now much larger so it can reach out from under the shade of the Bramley. I should be able to be more versatile in the planting in this border now. The edge of the Conservatory Border has also been reshaped a little to help emphasise the curl. The Long Shoot now looks like this, not a great change as such, but a lot of potential. Of course what needs considering now is the planting to fill these new spaces. One of the reasons for starting the reshaping this time of year is so that the soil can get frozen over the winter and further broken down. I can plant some bulbs in in now before they get planted up with other things too. 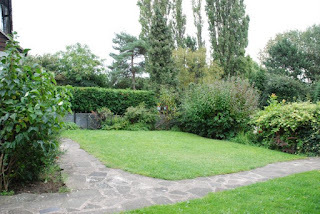 What I am not going to do though is buy lots of plants to fill these spaces, I cannot afford it and even if I could it would be hugely wasteful and not achieve how I like to plant these borders. I like repetition, not too much, but the same plant will appear along the border to give it some rhythm. Some plants will appear in the Pond Border and in the Coal Bunker Border to tie them together. Other plants will appear in the Pond Border and the Conservatory Border and others in the Conservatory and the Coal Bunker Border. Not many plants appear in all three apart from roses. Roses dominate the formal part of the garden but do not appear in the Tree Lupin border or the Woodland Border and Bog Garden. The only roses that side of the garden are the Rosa Wild Edric growing up the eating apple tree near the Dancing Lawn and there are a couple of wild roses in the Woodland Border. To fill up the new space I will probably buy some more roses, maybe five and I am yet to choose which ones though I would not be surprised if another Sir Clough did not find its way into the garden. I will then be dividing my existing plants to fill up most of the remaining space. I also have some fuchsia cuttings that will be looking for a home. The remaining gaps will be filled by seed-sowing I expect. This will not be an expensive undertaking but it is exciting and I am looking forward to making the planting that I see in my imagination appear in reality. I look forward to seeing what happens with them in the spring - I love the idea of having a plant that links different beds in different parts of the garden. We're liking the new shape and depth of the border Alison! Looking forward to what it'll look like next year. I love changing the shape of the lawn, making plans, deciding which plants to buy or seeds to sow, what an exciting time for you! I will look forward to seeing the results. I really like the re-shaping, graceful and enticing. And all that new planting space! I like your philosophy or repeating plants in different borders - and not just buying in plants in bulk. Says she who has bought more plants this summer than I think I ever have in my life! I like you approach to the reshaping, killing it off and then looking and thinking. Do you use glysophate? I am thinking I might try this instead of removing the turf in my front garden, I might manage it that way, as things stand, the grass would be staying for years yet! Happy seed sowing and cutting taking. Thanks - yes I do use glysophate, which I know is not approved of by many, but I learned the hard way that if I don't kill off all the lawn weeds they come back year on year and its just misery to deal with them. I have used this method for a few years now and it works for me. Thanks for all the kind comments, really appreciated.